The Portuguese Water Dog is a faithful friend whose courageous and playful personality requires a relatively decent amount of exercise and fresh air. Known for their athletic abilities and intelligence, the Portuguese Water Dog is a friendly and charismatic companion that enjoys staying physically active. Due to their slightly rambunctious attitude, it is preferred that these dogs receive plenty of space to play around in, and should not be kept in tightly enclosed environments. They take delight in being accompanied by a human partner during these physical adventures and due to their love for attention, are unable to be left alone for extended periods of time. As their name suggests, these dogs are most fond of spending time in and around bodies of water. Their webbed toes and propeller-like tail, allow them to swim and dive with ease, making them one of the most aquatically talented dog breeds around. It is also known that Portuguese Water Dogs can develop a habit of biting and scratching when it becomes bored or does not receive a proper amount of entertainment. Often times, if they are not kept busy with recreational activities, they will develop habits of mouthy behavior. Not only is this a result of their lively nature, but this breed is also very intelligent, which requires them to be given a fair amount of mental exercise and brain stimulation. For the reasons provided, it is logical to conclude that this dog is the best fit for an owner who is ordinarily active. Recognized as a working dog by the American Kennel Club, they are also perfect for fulfilling the role as a service dog. These dogs are considered to be very obedient and due to their intellect, they learn quickly to master even the most complex of dog commands. This is proven by the fact that these dogs are known to help fishermen retrieve fishing gear and perform many other duties that were favorable for their captains. Due to their great attention to detail, they can also serve as great watch dogs. Another beneficial trait that this breed maintains towards being a great pet is their calming and compassionate composure, which is noticeable and familiar to those whom it has been introduced. Children are also capable of experiencing the affection of this creature who is a complementary asset to any family and is known to be gentle with young ones. Portuguese Water Dogs have many likable characteristics that enable them to befriend other fellow pets and animals as well. Their covering consists of a wavy, soft, fur, which is irresistible to those that are mesmerized by the swirling pattern of this breed’s luscious locks. This thick coat also provides them with great insulation that protects them from harsh weather conditions. Portuguese Water Dogs love to be pet and the silky texture of this dog’s fur, results in an equally enjoyable experience for both the dog and those who have the opportunity to pet it. Petting is also a great way for the dog to bond with people and familiarize itself with strangers. This breed has a tendency to be quiet most of the time but will express themselves through a distinguishable bark, to voice their desires. Their unique, multi-octave voice, allows them to produce a variety of different vocals which indicate their emotions. It is also common for the Portuguese Water Dog to perform what many call “expressive panting,” to show their desire for a playmate or food. Although their direct origin is unclear, one theory claims that this breed’s ancestry derives from the herding dogs that inhabited the Chinese-Russian border during 700 B.C. The extensive history of these dogs dates all the way back to ancient times along the coast of Portugal. It is stated that these dogs were viewed as sacred beings and were worshiped by the many people of the Algarve coast. The people who lived on the coast had a profound affection for the breed and punished anyone who attempted harm one. This breed’s true potential was eventually discovered by the fisherman of the Algarve coast. Sculpted by the water, these sea dogs were viewed as the perfect and most helpful shipmate anyone could ever ask for. Their duties consisted of retrieving fishing gear, chasing fish into nets, and alerting the captain of any possible danger. Many historical documents even state that these dogs were used in the Spanish Armada as message-bearers, who delivered letters between ships. Unfortunately, because new innovations during the industrial age replaced the purpose that these dogs served towards the fisherman, the breed became less helpful and were no longer used as shipmates. This breed then experienced a rapid decline in population which sent their species into near extinction. Thankfully, due to the recent universal admiration of this beautiful breed, the Portuguese Water Dog has now been making a comeback in popularity. As this breed started to reach what seemed like the end of its existence, many sympathetic dog-breeders like Dr. Vasco Bensaude, noticed their absence and attempted to enhance their popularity. 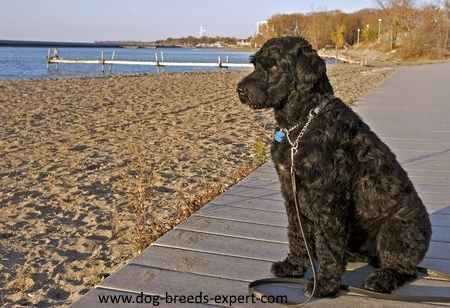 Starting with Dr. Bensaude’s advocacy for this breed in the1930’s, Portuguese Water Dogs have gained appreciation from several prestigious dog clubs in the past century. Thanks to the faithful supporters of this breed, the Portuguese Water Dog was recognized by the American Kennel Corporation in 1983, thus reviving the legacy that this breed possesses. In 2015, these dogs ranked 52nd in popular with the American Kennel Club. They can also possess different combinations of either black or brown, with white. 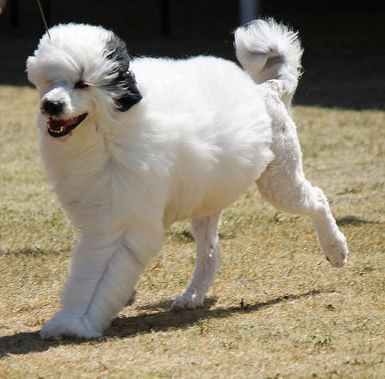 Thanks to this breed’s open-minded attitude, these dogs are known to be fairly easy to train. Having a long history of serving beside fisherman, one may recognize how these dogs have a naturally obedient personality. They are also known to be very receptive to criticism and usually don't whimper when they are yelled at. It is important for these dogs to learn their place in the relationship they have with their masters, at a young age. Having a somewhat over-ambitious disposition, Portuguese Water Dogs may test their owner’s boundaries. In most cases, this kind of attitude is just playful banter, but if it is not restricted, they will continue these actions and eventually develop reckless behavior. Asserting your dominance as an owner over this breed can prevent future instances of them behaving as if they are in control. Among the many ways one can train a dog, the most effective method appears to be what is know as “crate training.” This method suggests that the owner use a crate or cage as a training tool. By using the crate as some sort of dormitory for the dog, it will become increasingly more adapted to the environment and learn to respect and appreciate his personal space. This method is most effective when potty training a pup as accidents typically occur in the cage instead of on your new one-hundred and fifty dollar, oriental rug. Due to their keen sense of hearing and intuition, the Portuguese Water Dog will serve as an excellent watchdog who scares away even the sneakiest intruders. Their multi-octave voice can also produce a distinguished and alerting bark that will allow you to be prepared for any unpleasant encounters. Although they will not physically defend you from harm like a guard dog would, this dog is an effective sentinel that won't allow any suspicious activity go unnoticed. These dogs are born with a coat that is either wavy or curly and sometimes even a mixture of these two types of fur. Because their hair grows thick and quickly, It must be trimmed regularly or else, the coat will keep growing until it reaches an unmanageable state. Another reason they must be trimmed quite often is that they hardly ever shed their coat, which is beneficial to any owner who suffers from allergies to dog fur. Considering the fact that professional groomers are typically an expensive investment, one may want to think about learning how to clip their Portuguese Water Dog on their own. 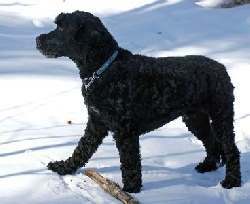 The most common grooming styles for the Portuguese Water Dog are the “lion cut” and the “retriever cut”. The lion cut consists of shaving only the hindquarters, muzzle, and base of the tail, leaving the rest of the dog’s fur at full length. The lion cut’s origin derives from the method of trimming that the Portuguese fisherman found most efficient and beneficial for the breed and the purpose that they served to the fishermen. Although the lion's cut is known as a more traditional style of grooming for the Portuguese Water Dog, the retriever cut has proven itself to be more popular with this breed in recent years. The retriever cut is a clipping process that uniformly trims the dog’s fur to a one-inch length. This pattern is a more popular and mainstream cut that many people find more of an appealing look for this breed. Not only does their hair need to be trimmed regularly, but to completely maintain their hygiene, they also need to receive many other forms of care. In addition to clipping, their coats must be brushed or combed on a weekly basis. Brushing also plays a significant role in the dog’s dental care. By brushing your dog’s teeth, you can prevent them from developing oral health problems as well as bad breath. No different than any other dog, the Portuguese Water Dog also has to be bathed regularly. It is important to use dog shampoo when going through this process for it contains treatment that is essential to keeping your dog’s fur healthy. Clipping toenails is also another typical procedure that is performed on all dogs. To keep your pet from scratching and damaging any sensitive surfaces, you can perform this operation by either using an electric grinder or a pair of nail trimmers. Although not much can be done to prevent your dog from inheriting particular genetic diseases that it is vulnerable to, informing yourself on the symptoms of these diseases is important and very useful. By educating yourself on the illnesses that are known to exist among these, you will be able to recognize certain signs in your pet’s behavior that can indicate these diseases, allowing you to prevent them from becoming a larger problem. 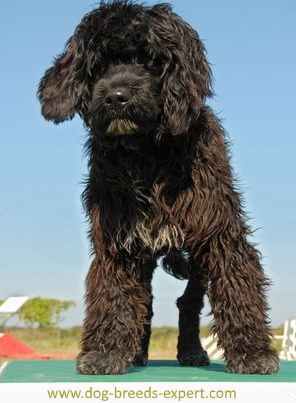 One other thing you must consider when adopting a Portuguese Water Dog is to find a responsible and well-experienced dog breeder who thoroughly reports any genetic defects that have the capability of causing issues. The list below contains any diseases that have had a history of affecting the breed. Many Portuguese Water Dogs have demonstrated the greatness of their breed through the remarkable accomplishments they have achieved. One particular document written by a Portuguese monk describes an account in which he watched a Portuguese Water Dog as it risked its own life saved a helpless sailor from drowning. 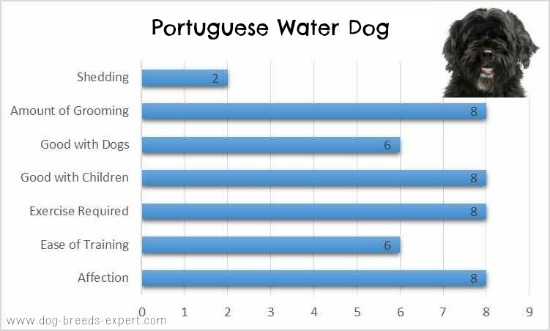 In addition to the impressive duties that they performed for Portuguese Fisherman and the Spanish Armada, this canine has also made quite the impression on modern day society as well. 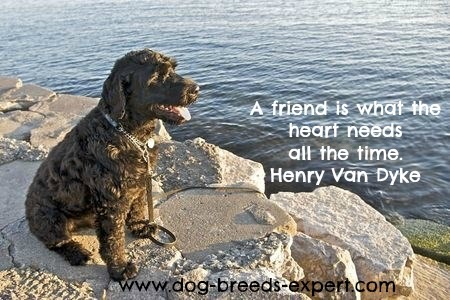 Perhaps the most popular Portuguese Water Dog today was often referred to as the “First Dog”. More formally known as Bo, this particular dog belonged to former U.S. President Barack Obama. Bo is a loyal friend of the president’s and is loved dearly as a member of the nation's first family. The hypoallergenic fur was a large deciding factor towards the president’s commitment to adopt Bo. The president was careful to pick a hypoallergenic dog breed that his daughter, Malia, could enjoy the pet without having to suffer from her allergy to dog fur. 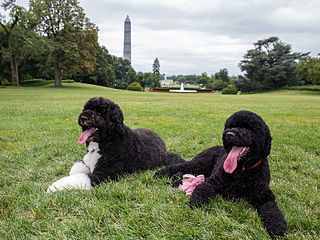 President Obama enjoyed the company of this breed so much that he adopted another Portuguese Water Dog, which he named, Sunny. She was initiated into the presidential family in August 2013 and along with Bo, they have raised an enormous amount of public awareness about the Portuguese Water Dog. Having been rapidly losing recognition since the beginning of the industrial revolution, Bo and Sunny provided the public admiration that it had lacked in since the 19th century. Senator Ted Kennedy is another influential political figure who had a Portuguese Water Dog. Splash was the name given to Mr. Kennedy’s friend who often sat as a spectator at many important meetings and hearings. This dog possessed many traits that many people would associate with great political leaders.